The Lloyd F. Collette professor of financial services at the College of Business Administration of Louisiana State University in Baton Rouge. He is also the editor of The International Review of Financial Analysis, which he cofounded. 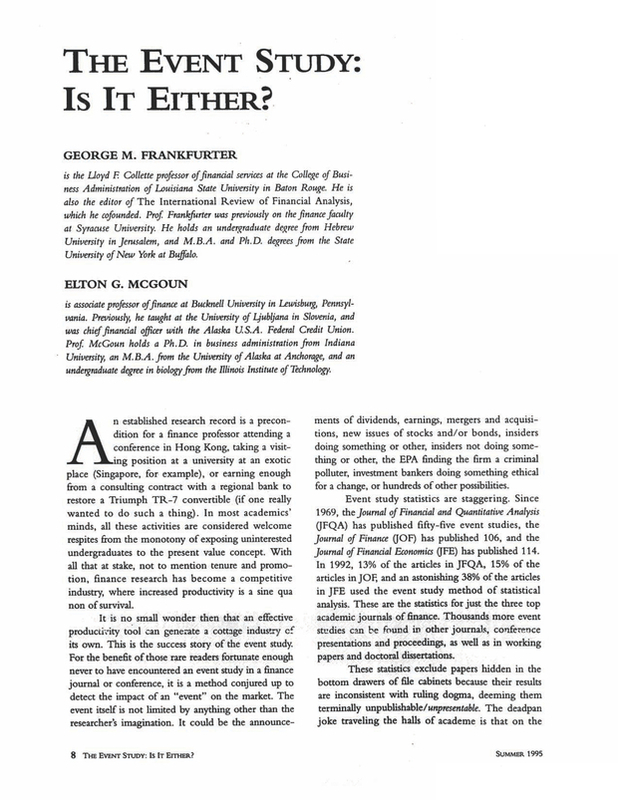 Prof Frankfurter was previously on the finance faculty at Syracuse University. He holds an undegraduate degree from Hebrew University in Jerusalem, and M.B.A. and Ph.D. degrees from the State University of New York at Buffalo. Associate professor of finance at Bucknell University in Lewisburg, Pennsylvania. Previously, he taught at the University of Ljubljana in Slovenia, and was chief financial officer with the Alaska U.S.A. Federal Credit Union. Prof McCoun holds a Ph.D. in business administration from Indian a University, an M.B.A. from the University of Alaska at Anchorage, and an undergraduate degree in biology from the Iliinois Institute of Technology.